A new type of implantable bandage could help mend broken hearts. Each bandage is a thin film that oozes a cocktail of molecules to heal tissue damaged during a heart attack. In experiments with rats and pigs, these patches helped minimize scarring and preserve the heart's ability to pump blood, researchers report online November 28 in Science Advances. Such devices could someday curb heart attack survivors' risk of heart failure. The base of each heart-healing film is a polymer sheet studded with tiny needles - similar to other microneedle patches that deliver vaccines but designed to stick to a patient's heart rather than her skin (SN: 8/5/17, p. 8). The surface of the polymer opposite the array of microneedles is coated in a gel containing cardiac stromal cells. These cells secrete molecules, such as proteins and tiny pieces of genetic material known as microRNAs, that support the growth of heart muscle cells. "We're treating [the patch cells] as little pharmacies," says study coauthor Ke Cheng, a biological engineer at North Carolina State University in Raleigh. 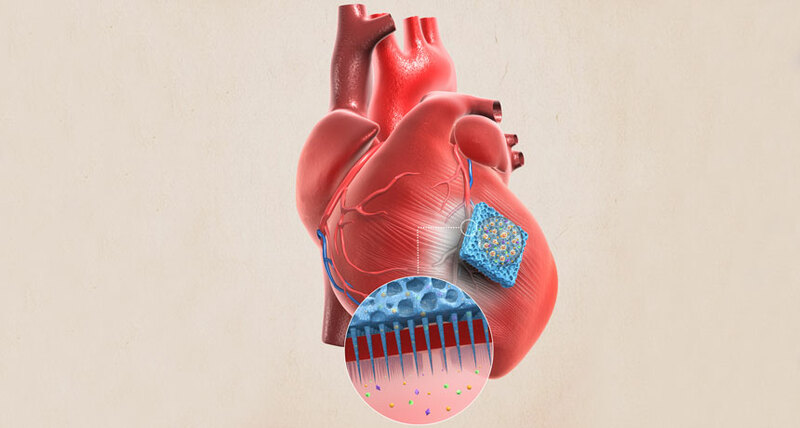 When a patch is attached to the heart, the microneedles funnel curative molecules from the cardiac stromal cells directly into the damaged tissue. In rats, Cheng's team tested how well the microneedle patches promoted healthy tissue growth and mitigated scarring. Three weeks after researchers induced rats to have heart attacks, the animals with microneedle patches had roughly 40 percent healthy tissue in the regions of their hearts affected by the heart attack, whereas as untreated rats had only about 10 percent. For the pigs, the researchers tracked heart health by measuring how much blood was pumped from the animal's left ventricle to the rest of its body with each heartbeat. Four hours after a heart attack, each heartbeat released about 56 to 57 percent of all the blood in the left ventricle, in both treated and untreated pigs. But 48 hours after the attack, the results began to diverge: Hearts treated with microneedle patches pumped about 60 percent of the left ventricle's volume, while untreated hearts pumped about 50 percent. The new microneedle design "is a very interesting and exciting" idea, but researchers need to investigate how animals implanted with these patches fare over longer periods, says Tamer Mohamed, a cardiovascular researcher at the University of Louisville in Kentucky not involved in the work. Before these microneedle patches are used to treat humans, Cheng's team plans to swap out the polymer used in this study for a material that gradually dissolves inside the body. The researchers are also exploring less invasive ways to implant patches than open-heart surgery, Cheng says.